For years (like everyone else) we looked for the perfect holster to suit our unique taste. We wanted a holster that was built right and without compromise. We didn’t want a lot of frills, adjustments or parts to come loose, get lost or worse yet break! We wanted a holster that would stay put, keep the gun in place, plenty fast for competition but retain the gun well. We wanted a design that was built to carry a gun without compromise; easily and comfortably concealed. 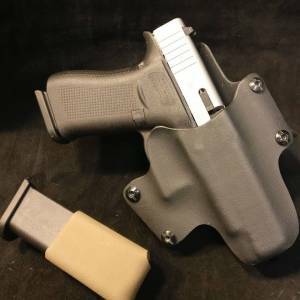 We wanted a holster that was designed from the ground up to be a concealment holster! We wanted a holster made for all day comfort but with a fast presentation and built to provide a lifetime of daily use. Available in both outside the waistband (OWB) or inside the waistband (IWB) versions. As much as anything else we wanted a holster that was handmade with attention to detail and purpose built where form followed function, providing a stable, secure and reliable platform. What we found is true in many endeavors “If you want something done right, do it yourself”! So we did, and the innovations continue….. The Protective Services “Epitome” OTP/ITB holster is the culmination of years of work to better conceal an every day carry firearm. Inside the waistband is typically easiest to conceal but not always the most comfortable. We first created a modern solution with our “Enigma” Outside the waistband/inside the belt holster. Truly the first of it’s kind in well over 100 years of holster development. With the “Epitome” we re-shaped, changed some angles, retained a 15 degree cant and tweaked the retention a bit to create a holster in the same lineup of outside the pants but inside the belt that all but makes a pistol disappear! As long as the belt loops on your pants are 6 inches apart, the holster will fit. There are no splitting belt loops with this design, so the belt loops on your pants dictate where the holster is best worn. We wanted a belt holster adjusted for cant that was comfortable, durable and would retain the gun no matter the conditions. We know that not everyone will invest in a purpose built everyday carry gun belt… The “Epitome” solves that problem. The belt doesn’t play near as big of a role with our design, allowing a wider range of options to best suit your attire. We wanted a holster that rode close enough that concealment was easy, even in simple cover garments, we had it before and now we have it even better! All Advanced Performance Shooting Holsters are individually engraved Make, Model, and date of manufacture, as well as the builder’s signature to ensure authenticity. At Advanced Performance Shooting, we are extremely proud to provide our customers with a truly superior product, backed up by our lifetime warranty. Images may not depict the particular firearm that is listed. The Protective Services “Elite” OWB holster was designed by military and law enforcement special operations veterans to suit our unique needs. Adjusted for cant, comfortable, durable and will retain the gun no matter the conditions. The “Elite” rides close to your body so concealment is easy, even in simple cover garments. 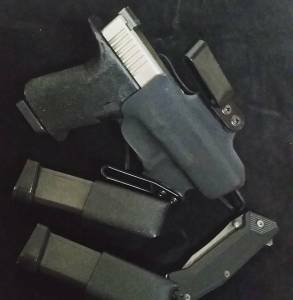 We built/designed a holster that was fast and suitable for everyday carry, training, and competition. Like everyone else, we have boxes full of holsters that are great for one or two things but lacked in other areas. This holster features a forward rake/cant of approximately 15 degrees to aid in concealment. All Advanced Performance Shooting Holsters are individually engraved Make, Model, and date of manufacture, as well as the builder’s signature to ensure authenticity. Sometimes smaller is better. We designed the “Event” as a minimalist type holster, simple but durable. Several of our close friends wanted an inside the waistband holster with virtually no cant, comfortable but secure enough for all day concealed carry regardless of condition. We designed the “Event” so that it can be comfortably worn in a variety of positions, from centerline to behind the hip, realizing that different body shapes and sizes create different concerns and degrees of comfort for the end user. We designed this holsters with a minimal forward rake/cant. All Advanced Performance Shooting Holsters are individually engraved Make, Model, and date of manufacture, as well as the builder’s signature to ensure authenticity. At Advanced Performance Shooting, we are extremely proud to provide our customers with a truly superior product, backed up by our lifetime warranty. Small of the Back carry is dangerous for the user and positions the firearm almost as far away from the fight as is possible on the human body. But for some there is a real need for deeper concealment whether it’s the environment or required dress. The Protective Services “ASOB” Almost Small of the Back OWB holster was designed by military and law enforcement special operations veterans to make safer this type of carry. We created a holster with a fairly extreme cant and a mounting system that almost forces the user to wear the gun not centered on their spin, rather to one side or the other. Because of the position this holster is worn, we designed a holster that will retain the gun well, but still provide a smooth draw stroke. Following our belief that form follows function we built a holster that conceals well, even with simple cover garments. 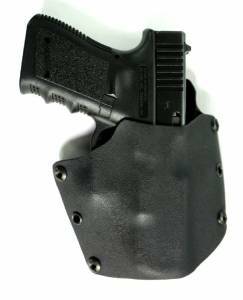 This holster features a forward rake/cant of approximately 35 degrees to aid in concealment. All Advanced Performance Shooting Holsters are individually engraved Make, Model, and date of manufacture, as well as the builder’s signature to ensure authenticity. 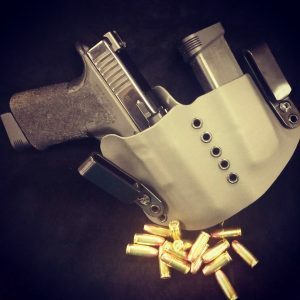 Centerline or Appendix carry has been around for a really long time, it just hasn’t always been as safe and a viable a means to carry as it is with current properly designed holsters. The “ELROD” came about after a great deal of work and from several requests from our friends and students. 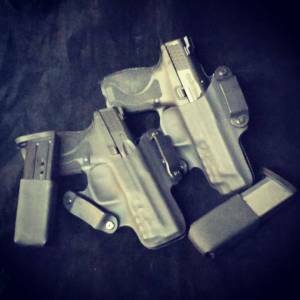 There are lots of options with regard to holsters marketed for this type of carry. The “ELROD” features 5 height levels of adjustment and as many levels to adjust. Many appendix type carry holsters don’t work as well if the end user has started to develop a little extra padding around the middle. The “ELROD” design helps take that extra padding into account and is beer belly approved. 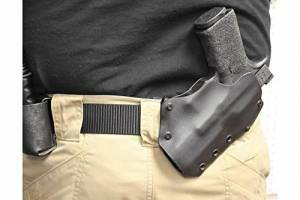 Protective Services “ELROD” holster was designed by military and law enforcement special operations veterans to suit our unique needs. We wanted an appendix style holster that was comfortable, durable and would retain the gun no matter the conditions. We wanted a holster that could be worn with a shirt tucked in or untucked equally. We chose to incorporate an integrated magazine pouch into the design to further aid in comfort and every day carry ability. All Advanced Performance Shooting Holsters are individually engraved Make, Model, and date of manufacture, as well as the builder’s signature to ensure authenticity. At Advanced Performance Shooting, we are extremely proud to provide our customers with a truly superior product, backed up by our lifetime warranty. Warranty does not cover other than intended use. Holsters are not designed to fit pistols with red dot optics, please contact us to discuss options. Living in a community serviced by several Law Enforcement agencies, right next to a large Military Installation and headquartered near several government offices, we saw a need for a holster that provided all of the safety benefits of our other Protective Services line of products, but was easy to take off without having to undress. Like our “Event” line of holsters, the “Express” features virtually no can’t, and utilizes a purpose built polymer clip to attach this inside the waistband designed holster. Realizing that many holsters that feature a quick on and quick off design fail when it comes to actually securing the firearm for the wearer, we built this holster with the same reliable friction adjustment system as all of our other holsters and used the best commercially produced polymer clip we could find. The end result is a holster that is all day dependable and will still stand up to the rigors of hard use training. All Advanced Performance Shooting Holsters are individually engraved Make, Model, and date of manufacture, as well as the builder’s signature to ensure authenticity. The “Longest Haul” was developed to fill a void in the market. 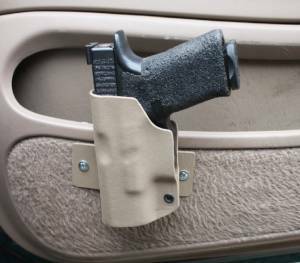 Many of our customers and friends wanted a platform to securely hold a pistol in a vehicle. Several of our friends had tried designs that simply weren’t stable, didn’t allow mounting options and in the end created more of a problem than a solution. 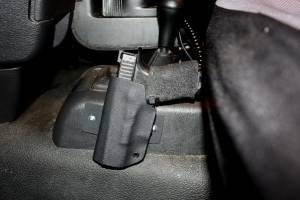 We designed a hard point mounted holster for use in a vehicle as a means to secure our primary, or a secondary weapon system in a location that the end user found most beneficial. Our “Longest Haul” holster can be mounted virtually anywhere you can attach the mounting bracket with the two provided self-tapping screws. Built with the same attention to detail and following the design lines of the “Event” and “Express” models, we utilize a simple mounting bracket to secure the holster to the mounting surface. Our design works best with shallow angles and horizontal mounting areas, but doesn’t limit the user to one or two specific areas. This is not a cheesy “one size fits all” approach to mounting a firearm, rather, our design features a handmade and fitted holster with a unique mounting system with all of the attention to detail as the rest of the Protective Services line of holsters. All Advanced Performance Shooting Holsters are individually engraved Make, Model, and date of manufacture, as well as the builder’s signature to ensure authenticity. 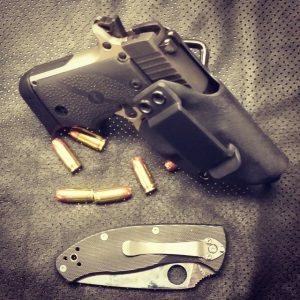 The Protective Services “EDC1” OTP/ITB holster was designed by military and law enforcement special operations veterans to suit a very unique requirement. Everyone knows that “Inside the Waistband” is the most concealed type of carry. But it isn’t always comfortable. Requiring pants larger than you would normally wear is but one of the issues associated with traditional IWB holsters. Outside the Waistband is more comfortable, but is harder to conceal (for some) and requires a quality purpose built belt. Our “Elite” series holsters are awesome, conceal well and are extremely comfortable. But we weren’t satisfied and we wanted to see if we could hide the gun outside the pants even better than the “Elite” series allows. We wanted to retain our 15 degree cant and we wanted a holster that had the correct amount of retention to allow a secure carry, but a fast draw. We wanted a holster that could easily go from “duty” to “training” to “competition” and all of the things in between. As long as the belt loops on your pants are 6 inches apart, the holster will fit. There is no splitting belt loops with this design, so the belt loops on your pants dictate where the holster is best worn. We wanted a belt holster adjusted for cant that was comfortable, durable and would retain the gun no matter the conditions. We wanted a holster that rode close enough that concealment was easy, even in simple cover garments, we had it before and now we have it even better! 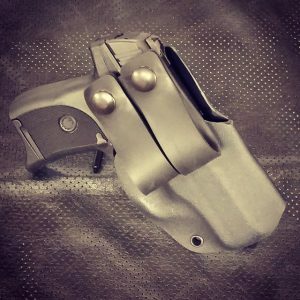 The “EDC1” will even function as a traditional IWB holster, and it’s tuckable. All Advanced Performance Shooting Holsters are individually engraved Make, Model, and date of manufacture, as well as the builder’s signature to ensure authenticity. At Advanced Performance Shooting, we are extremely proud to provide our customers with a truly superior product, backed up by our lifetime warranty. Images may not depict the particular firearm that is listed.